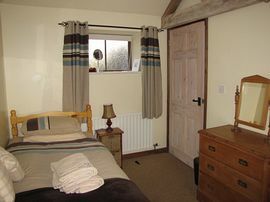 * Attractive three bedroom cottage professionally converted from 19th century stables. * Open floor plan, vaulted ceilings and exposed beams. * Sleeps 6 + 1 - cot. * Central heating and hot water included. * Linens, duvets, cleaning supplies included. * Bathroom - bath and shower. * Wood burner - wood included. * Fully fitted kitchen including microwave. * Washing machine and tumble dryer. * Paddocks available by arrangement. * Stable Cottage doesn't have a garden but there is a patio to enjoy watching the horses go by. * Two parking spaces. Extra is required. * Welcome package will be provided; Tea, coffee, milk, biscuits, cereal, fresh eggs, etc. * Wi-Fi throughout Stable Cottage. Open plan, vaulted ceilings, original beams. Two parking spaces, and extra parking through gate if required. Local Services: Railway with direct link to London 5 minutes away. Direct train link from London to Barnham, then a 5 minutes car ride to Stable cottage. Taxi rank outside the railway station. Nearest airport is Gatwick or Southampton, and both have direct railway link to Barnham railway station. Low season £400 - £550 pw. High season £550 - £650 pw. One hundred pounds non refundable deposit is required, and counted towards final amount paid two months in advance. January to December, all year round. Here are some of the reviews of our Guests this year. 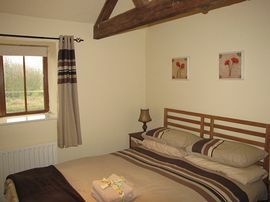 "A warm and Cosy cottage, very well kitted out...some lovely touches" May 2010. "I cannot remember that we have ever stayed in such a complete cottage. We will surely recommend it to our friends"! July 2010. "We thoroughly enjoyed our stay in Sussex and the cottage we found to be very comfortable and was ideal for our requirements". Mr & Mrs G. July 2010. 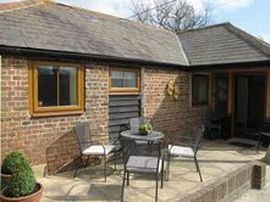 "Had a fantastic stay at Stable Cottage. 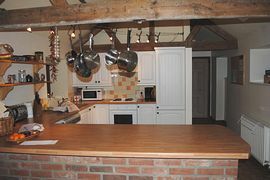 A comfortable cottage and very well stocked kitchen. We really enjoyed sitting out on the terrace with a glass of wine after a fun packed day, watching the sun go down". August 2010. 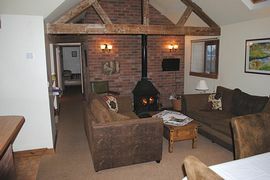 "Weather effected week made more than bearable by your lovely cottage. the girls loved it and would love to see it again". August 2010.